While Assam CM Sarbananda Sonowal on Thursday claimed that the coalition Government has adopted a policy of zero tolerance against corruption and 74 government officials including one retired and two serving IAS officers were arrested, the All Assam Unemployed Association (AAUA) stated that the Sonowal-led Government has failed to fulfil its promise of a corruption-free Assam. On the occasion of the second anniversary of the BJP-led Government in Assam, Sonowal claimed before the media that their Government has been able to drastically curb corruption in the State. Hazarika also condemned Assam Panchayat and Rural Development Minister Naba Kumar Doley’s statement that the recruitment test held recently for various posts in the P&RD Department was “conducted in an organised way across the State”. It may be mentioned that one Blum Electronic company conducted the recruitment test for various posts in P&RD Department across the State on May 20 with many irregularities. As per reports, question paper was leaked through WhatsApp and images of candidates using mobile phones in the examination centres went viral on the social networking site Facebook. Moreover, Hazarika demanded that responsibilities be given to the universities in the State to set question papers for recruitment tests. The Association dashed off a memorandum to Minister Naba Kumar Doley demanding re-conduct of the recruitment exam for the vacant posts under the P&RD Department, which was held on May 20. 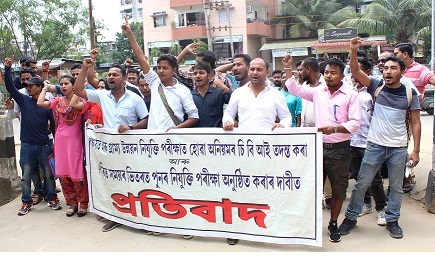 Meanwhile, on Thursday, a large number of candidates staged a protest against irregularity in the P&RD recruitment examination in Guwahati and demanded re-examination.